The Central Pasco Chamber of Commerce presented Tax Collector Mike Fasano and the staff of the Land O’ Lakes office its “Heart of Pasco” Award. According to the Chamber the award is given to local businesses that work hard to meet the needs of the business community, encourage jobs, and provide community service overall. For several months during 2017, the current location of the tax collector’s office at 4135 Land O’ Lakes Blvd. (US 41) was under renovation. For many years the building was home to the central Pasco branch of the county health department, which relocated further north on US 41. The then-unused building provided the ideal location for a larger tax collector’s office, long-needed to serve a growing population in Central Pasco. Assistant Tax Collector for Internal Services Billy Poulos was the project manager, bringing Mr. Fasano’s vision for a larger, more customer-friendly office with the latest technology to life. 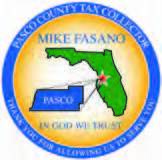 Another important aspect of the award is the fact that the Pasco Tax Collector’s Office has been actively involved in dozens of charitable giving programs since Mr. Fasano took charge in 2013. 58 different charities have received nearly $600,000 in charitable donations since the campaign began almost six years ago. In October of 2017 the new office opened and has proven to be a big hit in the community. With a larger waiting room, more space for customer service and overall a much more attractive building, the standalone office caught the eye of the Central Pasco Chamber of Commerce, which ultimately led to the receipt of the “Heart of Pasco” Award.